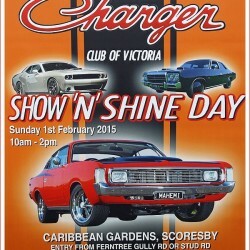 The Charger Club Show n Shine day 2015 was hosted by the Charger Club of Victoria at Caribbean Gardens in Scoresby on Sunday 1st February 2015. Melbourne’s weather was up to scratch with a few light showers early in the morning but settling into a fine day with temperatures in the low twenties. The cars are generally well organised with separate areas set aside for Chargers, Pacers, other Australian Valiants and Chryslers, US models, etc. Having been to this event for the last several years, we couldn’t help but notice some “regulars” as well as several cars we hadn’t seen before. Numbers wise there possibly weren’t as many cars here as last year, but overall the quality of cars was great and prize winners are to be congratulated. Click Here to visit our Car Shows & Events Image Gallery for more images from the Charger Club Show n Shine 2015. All images are available for purchase as high quality photographic prints or as digital download. Prices start at $10 for a digital download and from $15 for an 8” x 12” print (plus postage).